When your local river is in flood it can often be a great time to go fishing for the Barbel. Care is needed when fishing in these conditions, but Barbel are sometimes more eager to feed in these conditions, and it can be easier to locate them. I fish a section of the river Bristol Avon, which I know fairly well, so when it’s in flood, I know where the features are. So on a very rainy day in December a few years back, I decided to take a trip to my local stretch and have a crack at the flood conditions. As soon as I arrived on the bank I found a little swim with slack water with a tree half submerged downstream. I have caught Barbel around this area before, and with most other parts of the river a torrent of brown water, it seamed like the obvious swim to plonk a bait into. I kept the rigs simple with just a sliding pebble weight on 10lb line with a size 8 hook. 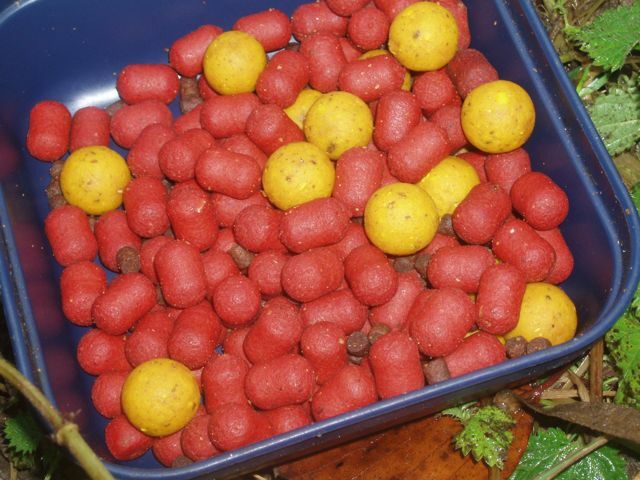 I also attached two bait bands to the shank of the hook so I could put two Nash (Monster Barbel) boilies on. The smellier the baits the better in these types of conditions. After putting in a couple of freebies I gently cast my rig into the slack water just off of the tree, and cowered under a tree from a heavy storm! Within 20 minutes my rod tip flew round and I was into a Barbel. Now one thing to mention about fighting a Barbel in flood conditions is to try and stop from heading into the main flow of the river. If you think a Babel powerful swimmers, just wait until you add the force of a swollen river into the mix. Unfortunately for me I had just this problem and it was a relief to get it out of the main flow and into the net. Not a monster at 4 1/2lb, but a Barbel! I recast a couple of times and after a few hours and a few more storms, which on some occasions were pleasant to watch, my tip flew around again. Another barbel had fallen for the bait, and it too went tearing off, but this time I kept it in the slack water. As I was playing this fish the heavens opened, so I settled for a guessed weight of 5lb. I gave it another hour, but with increasing high winds, driving rain and fading light I decided it was best to pack up. What at first looked like one of those days hampered by the weather, had actually turned into a nice, all be it short, winter Barbel session, and gave me a lot of hope for catching more throughout the winter.